WeekdayPicker is a custom UIDatePicker with weekdays. You can choose one of theses options to install WeekdayPicker.  CocoaPods — CocoaPods is a library dependencies for Xcode projects.  Swift Package Manager — Package manager for the Swift. The [Swift Package Manager](https://swift.org/package-manager/) is a tool for automating the distribution of Swift code and is integrated into the `swift` compiler. It is in early development, but WeekdayPicker does support its use on supported platforms. Once you have your Swift package set up, adding WeekdayPicker as a dependency is as easy as adding it to the `dependencies` value of your `Package.swift`. If you prefer to not use any of the dependency managers, you can integrate WeekdayPicker into your project manually. After adding the framework to your project, import the module. 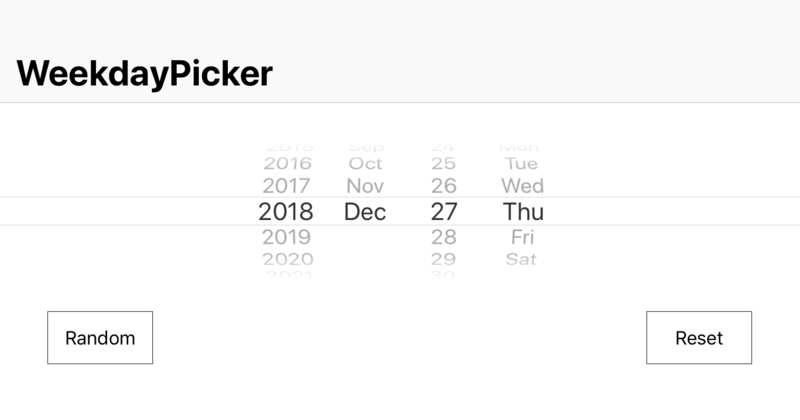 WeekdayPicker is released under the MIT license. See LICENSE for details.